This farro salad is a fresh and colorful blend of grains, vegetables, olives, feta cheese and herbs, all tossed in a homemade dressing. An easy and unusual salad that’s healthy and can be made in advance. I love a good salad, and sometimes the best salads don’t even involve lettuce. When I’m looking for a way to get my veggies in, I turn to orzo salad, chickpea salad and this fabulous farro salad. I love looking for new ways to get my veggies in, and this farro salad is a real winner. It’s a blend of fresh veggies, chickpeas, feta cheese and olives, all tossed in the most delicious homemade vinaigrette. This salad is healthy, full of protein and will earn you rave reviews from family and friends. 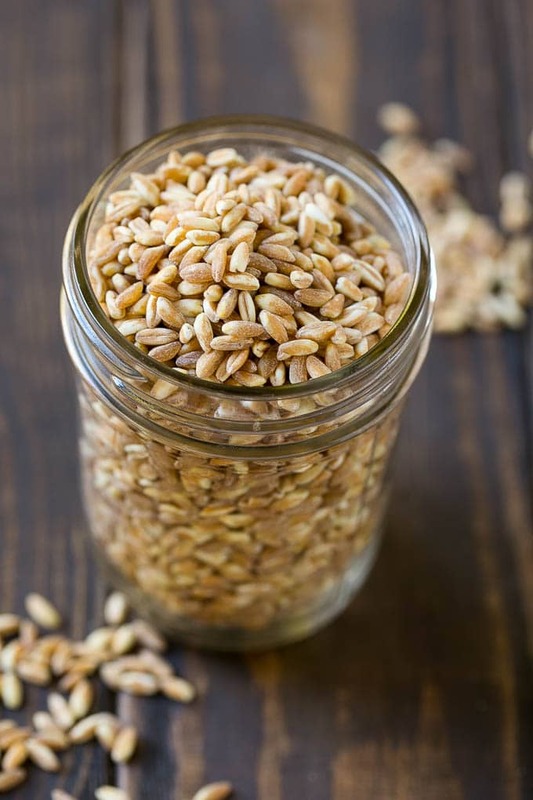 Farro is a type of ancient wheat grain that has the hull removed. Farro is sold in the rice area of most grocery stores, and can be prepared by boiling the grains in salted water for approximately 20 minutes. Farro has a pleasant, chewy texture and mild flavor. How do you make farro salad? 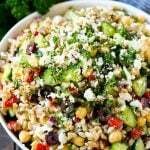 To make farro salad, you will combine cooked farro with cucumbers, roasted red bell peppers, chickpeas, kalamata olives, red onions and feta cheese. Everything gets tossed together with a simple savory dressing. From there, you can either serve your salad immediately or refrigerate it for up to 6 hours. I like to use the small Persian cucumbers for this salad. If you can’t find this variety, use a seedless English cucumber instead. I use a bottle of pre-prepared roasted peppers for convenience sake, but you can roast fresh peppers if you prefer. This salad calls for parsley because it adds a fresh flavor and many people always have it on hand. If you don’t have parsley, other great herb options are dill, chives or mint. Make sure to cut all your veggies into small pieces so that they blend well with the tiny grains of farro. If you’re looking to save time, cook your farro in advance, up to 3 days before you plan to make this salad. Farro is full of nutrients! It contains plenty of fiber, protein, magnesium and zinc. It also contains a variety of antioxidant compounds which help protect against diseases. It’s a great substitute for refined grains such as white rice. 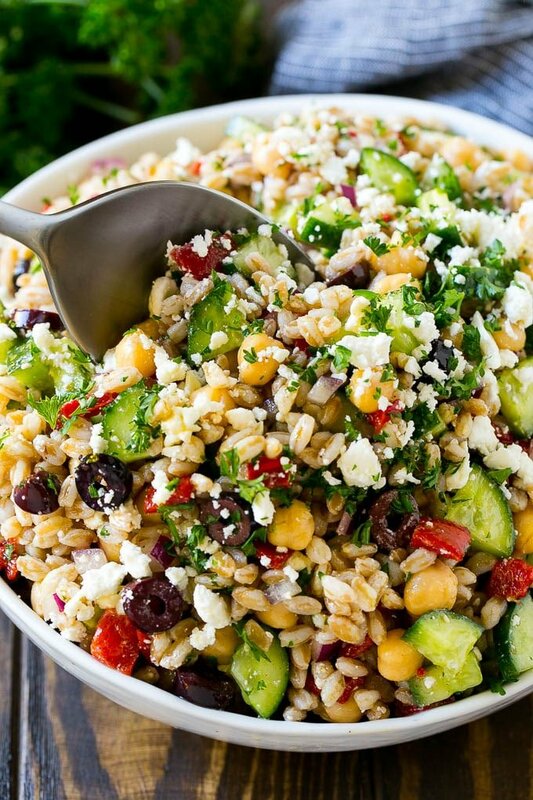 There are so many different ways to flavor your farro salad! Here are some of my favorite optional additions to this recipe. Farro salad makes a great side dish, vegetarian main course, or potluck offering. It’s unexpected and unique, yet full of flavor and texture. Every time I bring this salad to an event, I get a ton of requests for the recipe! This farro salad is a fresh and colorful blend of grains, vegetables, olives, feta cheese and herbs, all tossed in a homemade dressing. An easy and unusual salad that's healthy and can be made in advance. 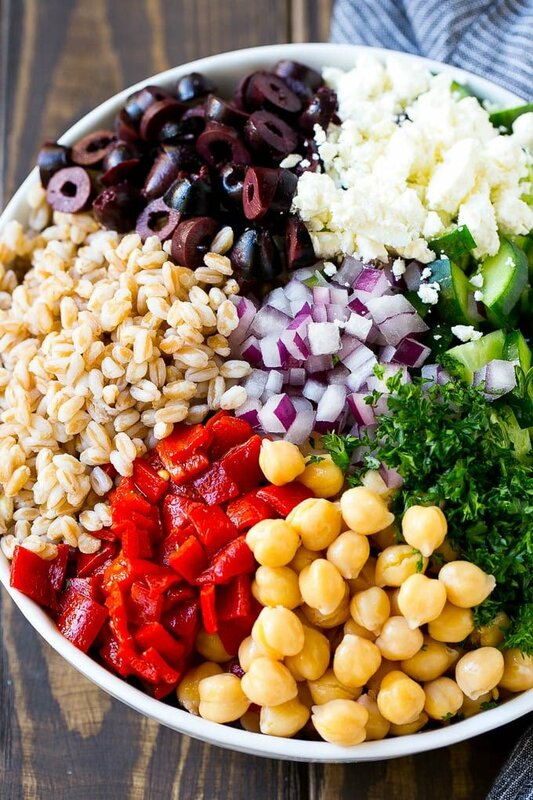 Place the farro, cucumbers, chickpeas, roasted peppers, red onion, feta cheese, olives and parsley in a large bowl. Make Ahead: The farro can be made up to 2 days in advance and all of the vegetables can be prepped the day before. Little Helpers: My kids love to assemble the salad and shake up the dressing! This post was originally published on June 4, 2015 and was updated on February 3, 2019 with new content. I’ve been using this recipe for potlucks and everyone always enjoys it! I’m always looking for recipes that can help me lose some weight. 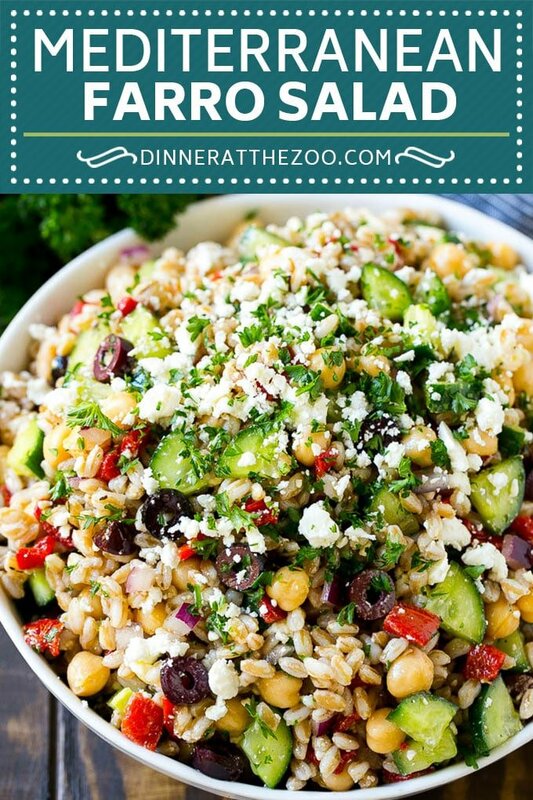 Your Mediterranean farro salad looks like a good addition to my list of recipes to try. Thanks! Finding fresh ingredients for a salad can be exciting. We love mixing ours with different flavors. This looks like the perfect side dish for just about any meal. I love the mixture of flavors. I love how flavorful it looks! I can’t wait to give it a try! 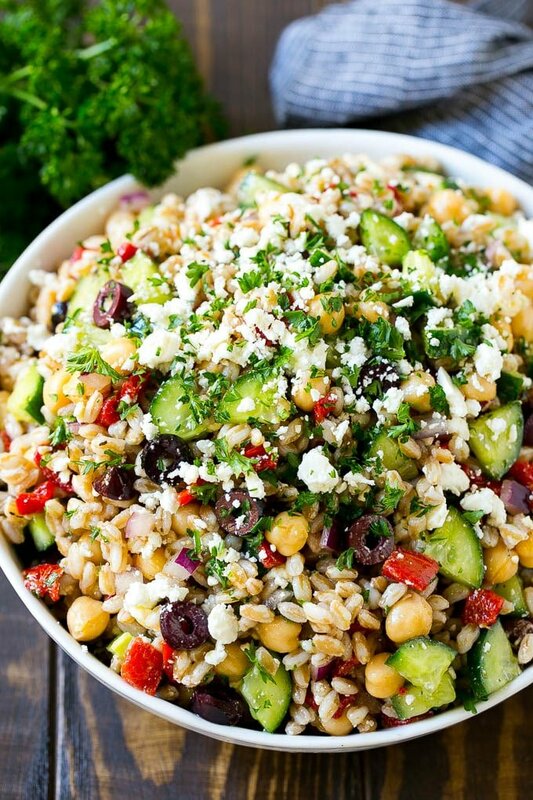 Farro Salad with Feta looks so healthy and easy to do. I hope I can make this at home. It looks so delicious and perfect for family gatherings! The salad looks yummy & healthy.Must try making it. I like all of the color in this salad. Tasty and healthy is my favorite combination, so this is a definite must try! 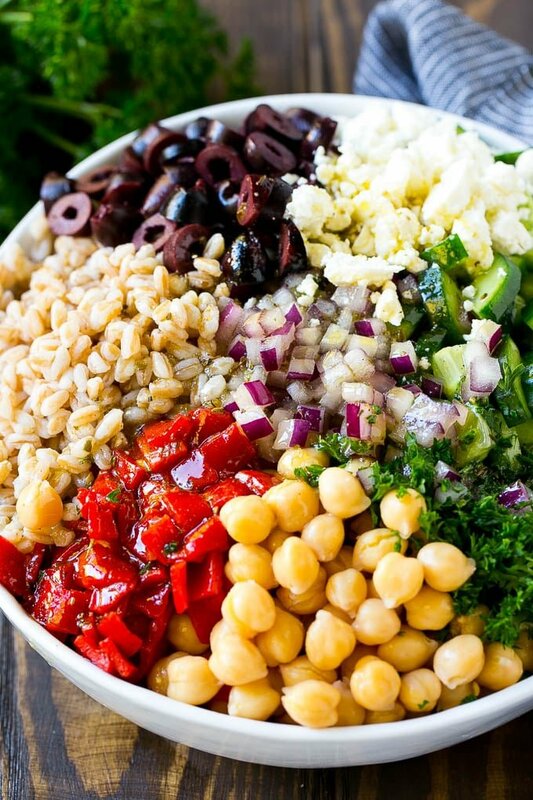 Mediterranean salads are my favorite. I love how delicious flavors like Greek olives, feta, and chickpeas can come together to create. You had me at feta. It is my favorite cheese and definitely my favorite salad addition. This salad seems to be filled with many of my favorites and looks like a dream come true! As a vegetarian, I appreciate the added protein farro provides too. How good is farro! It’s so much easier to find these days. Can’t wait to try the recipe. Salads and feta cheese… my two favourite things! I’m totally going to try making this recipe for lunch one day this week. Thank you for sharing! This looks so yummy and healthy! And your chopping looks like perfection too. That looks delicious. I’ve never had farro salad before. I’ll have to give this a try. I love Farro salad and have tried it with your variations and a ton of other add ons as well. I love all kinds of salads, year round! Ooh yum, this looks so fresh and colorful. Must give it a try! Oh the iceberg with ranch is what I grew up on! More like ranch with a bit of iceberg….but good thing my tastebuds have improved and I crave salads like this gorgeous one!